Our name , most of the time stands for our Identity. It usually has two parts, consist of surname and given name. i.e. the individual family identity and individual’s identity. In the Chinese culture as in most of the other cultures, the surname is the indication of the clan of one’s origin, and the given name give some idea of expectation or wishes of our parents or their hope for us. Before 2, 300 years ago, most of the people did not have Surnames, for at that time the surnames were for the royalty and the aristocrats. In other word, it is a privilege or a title bestowed and not a right for everyone. 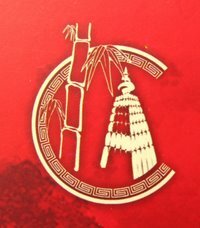 Wong – 王 (Royal name; Song – 宋(Descent of Righteous Prince); Hu –胡and Chen- 陳Royal names. After this time, the surnames were given to people by the decree of the emperor, or as a sign of recognition of the person as he as earned it by his position. Ma – 馬 the Tax officer; Kang – 康The Great Governor; Qian – 錢 The Treasuers . They took the name of their states in order to express their allegiance to a national or ethnic identity. Song – 宋; Chen- 陳; Wu- 吳; Tan – 譚 . Sometime the order of the seniority within the family is used as surname. The eldest is Meng - 孟; the second – is Chong 仲; the third is Shu - 叔; the fourth Ji- 季. It is estimated that there were more than 22,000 surnames in China, but due to elimination over the time, there are about 3,500 now. 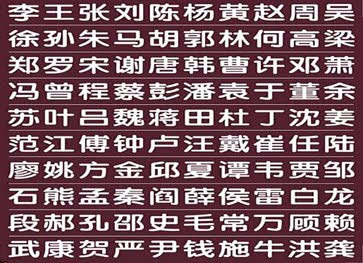 Although there are thousands of Chinese family names, the 100 most common surnames, which together make up less than 5% of those in existence, are shared by 85% of the population. The three most common surnames in Mainland China are Li, Wang and Zhang, which make up 7.9%, 7.4% and 7.1% respectively. Together they number close to 300 million and are easily the most common surnames in the world. Transliteration of Chinese family names into foreign languages poses a number of problems. Chinese surnames are shared by people speaking a number of dialects and languages which often have different pronunciations of their surnames. As a result, it is common for the same surname to be transliterated differently. So it is common for family names to appear ambiguous when transliterated. Example: 鄭/郑 (pinyin:Zheng) can be romanised into Chang, Cheng, Chung, Teh, Tay, Tee, Zeng or Zheng, (in pinyin, Chang, Cheng, Zheng and Zeng are all different names). Translating Chinese surnames from foreign transliteration often presents ambiguity. For example, the surname "Li" are all mandarin-based pinyin tranliteration for the surnames 黎 (Lí); 李, 理 and 里 (Lǐ); 郦/酈, 栗, 厉/厲, and 利 (Lì) depending on the tone which are often omitted in foreign transliterations.